The Free State Stadium, also known as Vodacom Park, is a stadium in Bloemfontein, South Africa, used for rugby union, as well as football (soccer). 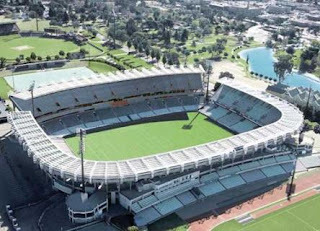 In advance of the FIFA World Cup 2010 South Africa, a second tier was added to the main grandstand on the western side of the ground, increasing the net capacity from 36,53 to 48,000. Additionally, new turnstiles were created, the floodlights upgraded, electronic scoreboards installed, the sound system revamped to the required standards, and CCTV and media facilities improved.